While students are cramming for exams, working and completing homework, it can sometimes be challenging to find and afford fresh food. This semester, the Edible Campus Gardens and Feed U Pantry have partnered to place healthy, fresh produce in the hands of busy students at the Friday afternoon Produce Pickups. U students with a valid uNID will find Edible Campus Gardens staff members and fresh harvested vegetables outside of the Feed U Pantry, on the lower level of the Student Union on Friday afternoons from 1-2 p.m., through Oct. 6. Produce available for pickup may include huge heirloom tomatoes, basil, chard, beans, zucchini, rhubarb, cucumbers, herbs and more, all grown on campus and gathered by student volunteers and the Garden Stewards. “Our goal is to offer fresh items for students at the food pantry. Everyone deserves local and healthy produce, students especially. I hope that the event only continues to grow,” said Jessica Kemper, Garden Program coordinator. 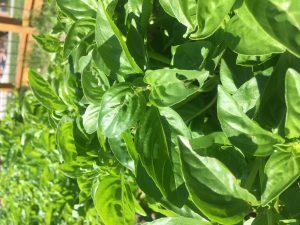 Supplying fresh vegetables to the university community is part of the mission of the Edible Campus Gardens. 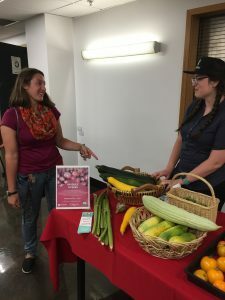 Produce harvested from the gardens is sold at the University of Utah Farmers Market and to different food vendors on campus. The gardens have historically donated unsold farmers market produce to the Feed U Pantry on Fridays in the fall. However, it has sometimes been difficult to distribute the produce before it spoiled. When Kemper arrived on campus in summer 2017, she began working with the Feed U Pantry to transplant an idea from her alma mater UW-Madison that would get the produce in the hands of more students. This idea has become the Friday afternoon Produce Pickups. In the first two weeks of the Produce Pickups, more than 20 students took 50 pounds of delicious vegetables home with them. Edible Campus Gardens staff members were also able to engage students in meaningful conversation about where the garden produce comes from, how to cook with it, and food resources available on campus, including the Feed U Pantry. “We are delighted to have fresh foods available through the Produce Pickups, and to help students become more aware of the resources the Feed U Pantry and Edible Campus Gardens have to offer,” said Nick Knight, executive director of the Feed U Pantry. 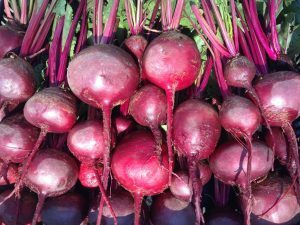 Current U students can check out the Produce Pickups for themselves and take home fresh, free vegetables. Don’t forget to bring your uNID (and a reusable bag) and head down to the basement of the Student Union this Friday from 1-2 p.m.